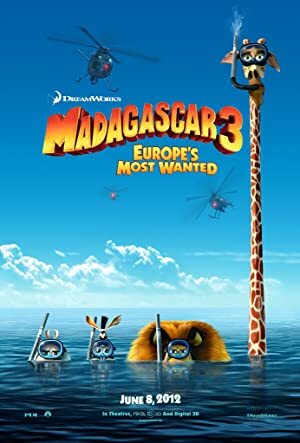 Madagascar 3: Europe’s Most Wanted (2012) – What's New on Netflix Canada Today! Alex, Marty, Gloria and Melman are still fighting to get home to their beloved Big Apple. Their journey takes them through Europe where they find the perfect cover: a traveling circus, which they reinvent – Madagascar style. Alex, Marty, Gloria and Melman are still trying to get back to the Big Apple and their beloved Central Park zoo, but first they need to find the penguins. When they travel to Monte Carlo, they attract the attention of Animal Control after gate crashing a party and are joined by the penguins, King Julian and Co., and the monkeys. How do a lion, zebra, hippo, giraffe, four penguins, two monkeys, three lemurs travel through Europe without attracting attention and get back to New York? They join a traveling circus. Their attempts to get back to New York are consistently hampered by the Captain of Animal Control who wants to make Alex part of her collection. Once they make it back to New York Marty, Alex, Gloria and Melman realize that they want to be part of the traveling circus.